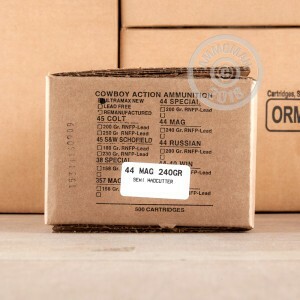 The 44 Magnum is a great, high power, handgun round. With the incredible power and massive size, the 44 Magnum is an amazing round for hunting and home defense and these new production rounds from Ultramax are a great way to hone your handgun skills. 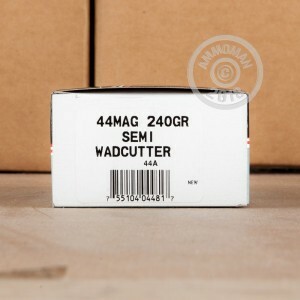 Once you pop in these 240 grain, semi wadcutter rounds, you will be set for punching holes in paper all day at the range. 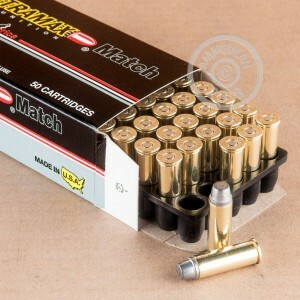 Ultramax ammo is loaded in America using high quality brass casings and boxer primers, making these cases re-loadable. When you order these American made rounds firing at 1175 feet per second, you will be getting high quality and reliable ammo perfect for volume shooting at the range. Good News! At AmmoMan.com all orders over $99 ship for FREE. So buy this case today and the shipping is on us!